The Holidays are rapidly approaching us. Parents are scrambling to buy the latest toys for their kids. But did you know that green toys are actually a huge hit this year? In the recent past, it has been difficult to get a hold of toys that are made of environmentally friendly products and/or made in the US. More and more toy makers are embracing the idea of “green toys” this year. It’s not just a push by consumers, it’s actually demand has risen for them. With so many toys being made without regulation and using dangerous products, it’s really no surprise. Since the products are made with more sustainable products and are usually not made in China, there comes a price, literally. The cost on these products is usually higher than the cheap plastic toys you would normally find. Usually they are wood toys or those made from recycled or sustainable products. They may be more expensive, but people are still buying these toys. Why might you ask? Well, the obvious answer is that they are better for the environment ans safer for their kids. Another answer that I have heard from those who buy these toys is that they are much more durable. They are made with higher quality and usually the products they are made from (i.e. wood) are much stronger. So in the end, you could actually be saving some money since you don’t need to replace toys that break easy. So what exactly is the future of “green toys”. If the trend continues like it has this year, we will see a good portion of the toys being sold made with environmentally friendly products. It will be hard to take over the toys we find on the market today. Many still like the fact that they are cheaper and kids will still be wanting the latest cheap toy of their favorite TV or movie character. If the prices of “green toys” can come down some as they already have and if recalls continue to happen, we may see them take a larger share of the market. It’s great that there are now environmentally friendly options for so many products. Now it is up to consumers to make the right choices. Then maybe eventually the less environmentally friendly companies will take notice and clean up their act. I think the market as a whole will continue to trend into the green products. Good to see that the demand is also headed that way. Our future depends on it thats all I can say really. It’s good to see this trend. Toys in recent years have really skimped on quality and using safe materials too. I remember my wooden toys from when I was young. They were so well-built, you could still play with them today as if they were new. Good point about how these products are safer for kids too. There have been many recalls recently of products that contained too much lead or other harmful substances. As kids are especially susceptible, their toys need to be quite safe. The best thing we can do to make our toys environmentally friendly is ensuring that they are reused when possible. There are many charities that would gladly accept used toys. Wow, can’t believe its been since 2010 since your last post Patrick, I hope all is well, and looking forward to when you get the chance to make another blog post! 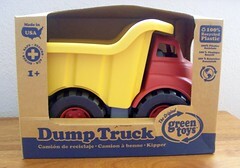 Another way to ensure your toys are more environmentally friendly is to try to avoid the fads. For example, they may have a favorite movie right now, but will they still like that movie in 6-12 months? So maybe avoid buying them toys related to temporary trends like that. Just found your blog via the treehugger forums. You have lots of great content here, I hope you continue to post sometime in the future! As far as green toys, I think they are well worth the higher price most of the time. I love the toys from the company “Plan Toys.” I bought my preschool aged son some trains and blocks from them and have my eyes on some more of their stuff for Christmas. They have high quality products that will last…and decompose once it’s life is over. Quality over quantity for toys is the motto in our house. The fact that kids usually only play the toys for a while only, makes it useless for the toys to be durable. green toys that cost much will not be favorable to the parents too. i wonder how well such toys be sold in the market. How are wood toys “green”? I have to assume that they are made from recycled wood. I am not surprised that the quality would be better then the cheap crap made in China. It is just so hard to pass up the cheap stuff because you can buy more toys and what is fun for the kids is opening the presents. I catch myself thinking about buying the cheap stuff.